Our weekly Thursday @ 11 meeting will be at Sophia's Cafe, 9191 E Frontage Road, P-W Hwy. Our weekly Thursday @ 1 Art Meets Recycling Get-Together will be at VCRS Recycling Center, 9465 E. Chanlyut Circle, Palmer. Coming to you Sunday, January 13, the Willow episode of The Alaska Home Companion—A Frontier Variety Show! The Alaska Home Companion—A Frontier Variety Show is the Valley Arts Alliance rendition of a live radio broadcast from the golden age of radio, with skits, music, and dance acts, similar to the popular Prairie Home Companion radio show on NPR. Alaska Home Companion will feature interesting stories by Alaskans about the best, the worst, and the silliest of everyday living in Alaska. See exciting scenes from previous year's episode at our AK Home Companion archive pages. The Valley Arts Alliance will be producing the Willow episode of Alaska Home Companion—A Frontier Variety Show, at the Willow Library and Community Center, as a Sunday Matinee, starting at 2pm. Suggested donation is $15. Join us for the 13th Annual VAA Wearable Art and Runway Fashion Show at the Palmer Depot. This year’s theme is BEWITCHED!. See exciting scenes from previous years at our Wearable Art archive page. We will be producing two shows this year, a 3pm Matinee and the 7pm Evening Show. Tickets are $15 for each, and for the 3pm Matinee ONLY, Children under 12 years will be admitted free when accompanied by an adult. Applications can be downloaded at this LINK, and must be received by Feb 8. "BEWITCHED!" - 2019 VAA Wearable Art Show! The Valley Arts Alliance is proud to host our 13th annual VAA Wearable Art & Runway Fashion Show at the Palmer Depot on February 16, 2019. This year we will present two identical performances—a matinee at 3pm and an evening performance at 7pm. This year we’re using the theme “Bewitched!” for staging the show, and we’re encouraging artists to use the same theme for their creative inspiration. To view exciting scenes from years past, visit our Wearable Art archives pages. The ticket price is $15 per person for each performance. For the 3pm Matinee ONLY, children 12 years old and under will be admitted free when accompanied by an adult. Tickets are on sale now—in Palmer at Fireside Books and Non-Essentials, in Wasilla at My House / Gathering Grounds, and in Big Lake at Top Drawer. Unsold tickets will be available at the door. VAA partners with Valley Performing Arts! The Valley Performing Arts will be producing “The Mousetrap” at the Machetanz Theatre, 251 West Swanson in Wasilla, from January 11 to January 27, 2019. A group of strangers is stranded in a country boarding house during a snow storm, one of whom is a murderer. The suspects include the newly married couple who run the house, and the suspicions in their minds nearly wreck their perfect marriage. Others include a spinster with a curious background, an architect who seems better equipped to be a chef, a retired Army major, a strange little man who claims his car has overturned in a drift, and a jurist who makes life miserable for everyone. Into their midst comes a policeman traveling on skis – he’s following clues from a recent murder in London and soon after he arrives, one of the guests is killed. The children’s nursery rhyme says there were three blind mice…two down and one to go. To get to the rationale of the murderer’s pattern, the policeman probes the background of everyone present and rattles a lot of skeletons. This play is another famous Agatha Christie who-dunnit with a switch finish! Chalk up another superb intrigue for the foremost mystery writer of her time. For more info, see their website or phone the Box Office at 373-0195. In the lobby of the Machetanz Theatre is the Valley Arts Alliance showcase that displays locally crafted original artwork by Valley Arts Alliance members. 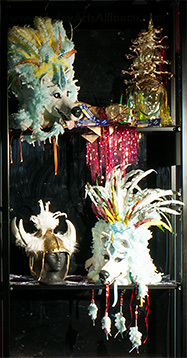 For the next several weeks, our showcase will contain headpieces from previous years Wearable Art and Runway Fashion Show. This year's event will be held on Saturday, February 16, 2019 at the Palmer Depot. The headpieces on display were made by Dianne Boyd and Colleen Wake. New displays at the Machetanz Theatre are being planned, so that we can provide VPA theatre guests with an opportunity to view our local community artists. Just another example of the Valley Arts Alliance bringing the community together through the arts! The Valley Community for Recycling Solutions (let’s call them VCRS) has graciously allowed us the use of their community classroom each Thursday, from 1 to 3pm. If you love to paint, sculpt, and create, and want to get together with other artistic people, this is the place for you. This invitation is extended to anyone, or any age, interested in Art, and Recycling. And best of all, it’s FREE. For more information, come to our weekly Thursday @ 11 meeting at Sophia's Café. The VAA and VCRS have been partnering for over 10 years. 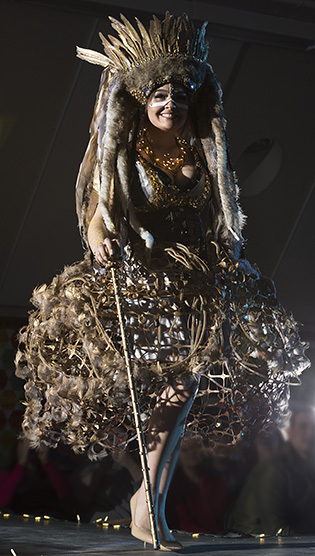 Our annual Wearable Art and Runway Fashion Show has many outfits made entirely out of recycled materials. So join us on Thursdays at the VCRS! They are located at 9465 E. Chanlyut Circle (49th State Street, on the P-W Hwy). On one day each month—the “Second Saturday” here in the Valley—we are encouraging local art galleries, restaurants, and retail businesses to join in with local and regional artists, sculptors, musicians, and food masters for a festive day of art and entertainment. This concept has been adopted in a variety of locations throughout America, and provides a festive atmosphere for visitors to plan a day on the town and browse the many participating stores and venues. A bookstore could schedule a book signing; a coffee shop could schedule a poetry reading; a gallery could have an artist demonstrate; or a retail establishment could provide space for a musician to play. All on the same day of the month—the Second Saturday. The Valley Arts Alliance is coordinating the "Second Saturday" project. Just email us if you are willing to participate and we will attempt to match up artists and venues. For a complete list of participating Second Saturday venues, please sign up for our newsletter. It’s that easy! Join us in supporting the arts in our community, and in helping to make our art community grow.